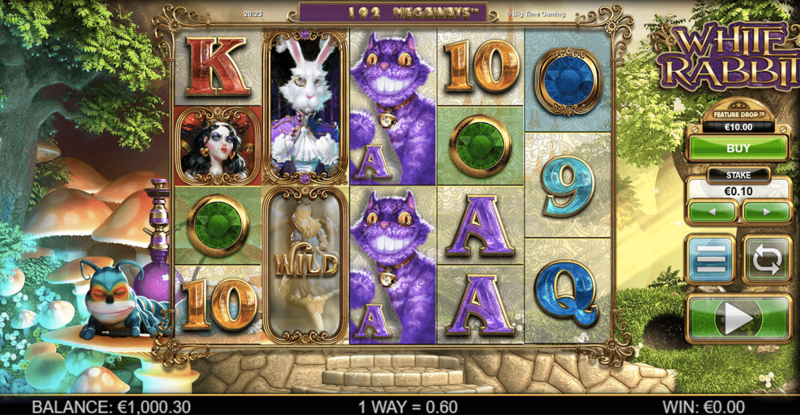 Taking inspiration from the classic Disney novel, Alice and Wonderland, the White Rabbit slot features the ever so popular White Rabbit character as the main character for this game. Spin this game and enjoy the bonus features but be careful to not fall down the rabbit hole! Brought to you by Big Time Gaming, the White Rabbit slot features a megawatts system which provides up to 243 ways to win. Learn more about new slot sites. Big Time Gaming software company were founded in 2011and although they are a small company, they still have a great portfolio of games. The software company was created by experts already in the online gaming industry and now provides progressive jackpot games, online slots and casino games to clients and players around the world. Popular titles from Big Time Gaming include Bonanza, Dragon Born and Gold. Come and play uk slot game now. The White Rabbit slot is themed to the White Rabbit from Alice and Wonderland. The graphics and artwork throughout the slot is high quality and full of magic with unique colours and landscapes make this a memorable gaming experience. The sounds in the background add to the atmosphere, making the gameplay more engaging and exciting. 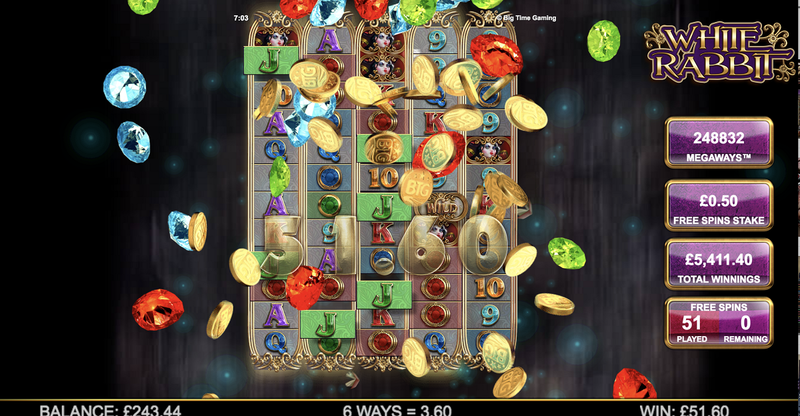 Symbols for this slot include the basic playing card numbers and letters (9, 10, J, Q, K and A) which are low paying symbols. The green, blue and red gems are higher paying symbols and can payout 0.3 to 0.5 times current stake for landing 3 and 2 to 5 time your current stake for landing 5 in a row. The Queen of Hearts is the highest paying standard symbol which will give players 25x their current stake for spinning 5 in a row. The Queen of Hearts is generous in this slot game, if you land 2 in a row you will still receive a payout of x2 your current stake. The wild symbol for this slot is the symbol that it titled ‘wild’ and can appear on the reels (other than reel 1) and substitute itself for any of the other symbols (apart from scatter symbol, cupcake and feature drop symbols) to help make winning combinations. The White Rabbit is the scatter symbols and will appear on reels 2, 3 and 4. Landing 3 of these scatter symbols will trigger the free spins round where you will be given 15 free spins. Whilst spinning in the free spins feature, reels can expand when cupcake symbols are landed. These special symbols can expand the symbols up to 12 positions. If you reach full size on one of the reels, you will be awarded another 15 free spins and the expanding reel will become the ‘Queen’s Reel’. With this superb bonus, there are 248,832 ways to win if you play your cards right and max out all the reels. The caterpillar symbol can randomly add bonus wilds to the reels (up to 4). When this happens they will also have x2 or x3 multiples attached and can become stacked. The feature drop allows players the option to purchase free spins whenever they fancy. For a small fee of 100x your spin bet, you can enjoy more free spins giving you the chance to win your money back and make some extra. There are more general Easy Slots promotions here, play today! If you’re a fan of fantasy themed slots, the White Rabbit is certainly worth a spin. The bonus game is one of the best paying games in the gaming world; this slot is full of action and fun. Sign up today and start deposit by mobile casino.